Three Rhodes University students scooped awards for their research presentations at this year’s 44thAnnual Geography Students’ Conference hosted by the University of Free State. 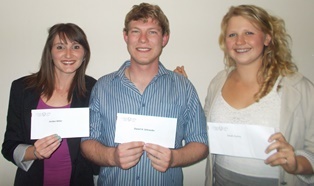 Daniel Schroeder, Sarah Hulley, and Jordan Miller received awards for the Best Masters Presentation in GIS, Best Honours Presentation in Environmental Geography, and Best Honours Presentation in Physical Geography respectively. The three were part of a group of 16 postgraduate students to attend the conference. According to lecturer Ms Philippa Irvine who accompanied them said the conference was an incredibly valuable experience. “Students get an invaluable opportunity to share their work and ideas with peers from all over the country and receive constructive feedback. It’s also an opportunity to network and make decisions about future research or employment. Conferences are very important for these reasons,” said Ms Irvine. Hulley, whose research was based on the water situation in Grahamstown and the inequity of access to water, said that the experience opened her mind to the diversity of research out there. “It was such a great experience to see the different perceptions people have and how a particular interest can spark an entire project,” she said. As one of the few human geographers among the postgraduate Geography students, Hulley revealed through her research that social status, race, class, and wealth continue to impact people’s ability to access water as an essential resource. Aside from the valuable learning gained through the conference, it was also a significant confidence boost for the winning students to have their research skills affirmed. “I had faced the challenge and the outcome was the best I could have hoped for. It proved that hard work really does pay off. I’m now much more confident in presentation skills,” said Miller. Her research was based on the hydrology of the Oyster Bay Headland Bypass Dunefield, an important feature of the coastal landscape. According to Ms Irvine, the department is extremely proud of all the students who worked hard and attended the conference. She believes that a large part of the success can be attributed to the nurturing, one-on-one support provided by students and staff to one another in the close-knit Geography department, one she believes reflects the structure and philosophy of the university itself. Last year, two Rhodes students walked away with awards and so Irvine says the success is on-going. All three winners thanked the lecturers who accompanied them to the conference and particularly acknowledged their respective supervisors for the integral role they played in guiding their research. The conference is largely organised by students for students.